The story is shaping up nicely as Cap and Sharon Carter endeavor to find out the ties between Hydra and Bravo. What happened to this former Ally who is now an enemy, and why are Cap and Sharon haunted in their dreams? And what does a giant robot double of Cap have to say about it? Review: Brubaker continues to mine the stories of the past. I, for one, am so tired of ripoffs being called homages or such. How about something new using WWII characters or other characters, like Bravo, or some other long lost menace or ally? No, instead, let’s go back to what the masters did in the 1970s and 1980s when you were a kid and just take take take. Brubaker has gotten away with this for a long time. The Ameridroid? Really? It wasn’t that great of an idea back in the day, but it worked to suit the purposes of the Red Skull. But now? Come on. For someone so lauded, I would expect better. If you want some serious original storytelling, read the Cap Theater of War mini series done by Paul Jenkins and others. Aside from Bravo, this is just rehash in the traditional Brubaker ripoff style. 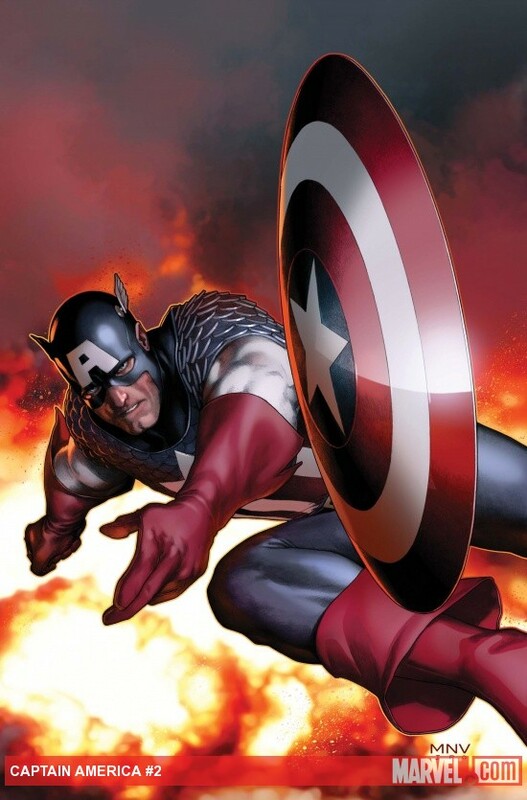 But, it is Steve Rogers as Cap, so I am not going to complain too much. The artwork is excellent and the cover shows Cap in an awesome fighting pose. Also, Sharon Carter is drawn very nicely. The dream sequences are presented in a very cinematic way.